Long overdue, but I’m finally sitting down to share some of the items I bought at Ulta during my Christmas break. My parents are gems for giving me a gift card (they know me too well). I was able to find some things on my wish list and other things. Let’s check it out. Mario Badescu Facial Spray w/ Aloe, Chamomile, Lavender – There was a lot of hype about this new spray. I use the beloved rose water, but I thought I’d give this one a try. I have used it at bedtime, after my cleaning/moisturizing routine, to help me relax. You can also spritz when your skin needs a pick-me-up. It does seem to be cool to use as a finishing/setting spray. The scent is a little too strong for my liking (I tend to use lavender when I’ve dealt with migraines), so that’s my reservation. I’m going to continue to use the “purple” for night time. But I can’t break from my rose water! Maybelline Master Chrome Metallic Highlighter in Molten Gold – I was hesitant to purchase this one since it’s become very popular. But I was looking for a new one, thought I’d test it out. But I’m glad I did – NEW FAVORITE HIGHLIGHTER. And it’s only $7. Real Techniques Miracle Complexion Sponge – It’s a 3-in-1 sponge; you can use the angles for contouring and blending. Currently, I use it to settle the translucent powder after applying my foundation and concealer. Neutrogena Hydro Boost Hydrating Cleansing Gel – I’m a fan of the Hydro Boost water gel, so when I heard about the new Cleansing Gel, I scooped it up. It’s under $10 and a little goes a long way. Leaves my skin feeling extra soft. A great addition to my skin care process. OGX Thick & Full Biotin & Collagen Conditioner – I bought the mini bottles a few months ago to try it out and I liked it. With the shampoo, this is my conditioner of choice. This is my favorite combo right now. It’s been a month and I can already feel and see the results; the ingredients are helping my hair get stronger and healthy. OGX has a lot of variety with particular vitamins and proteins that fit your hair needs. In the process of being more bold with my makeup choices, so I got the following, but haven’t tried them out. Maybelline Vivid Matte Liquid Lipstick in Rebel Red – I know there’s a red for everyone, but I’ve always so timid with wearing it. The only times I’ve worn a bright red was when it was required for dance and theatre performances. But I’m going to experiment soon. Also, an eyebrow pencil, glitter primer, and lip liner from NYX. In the end, my trip was very successful. I was able to get so much for under $100. 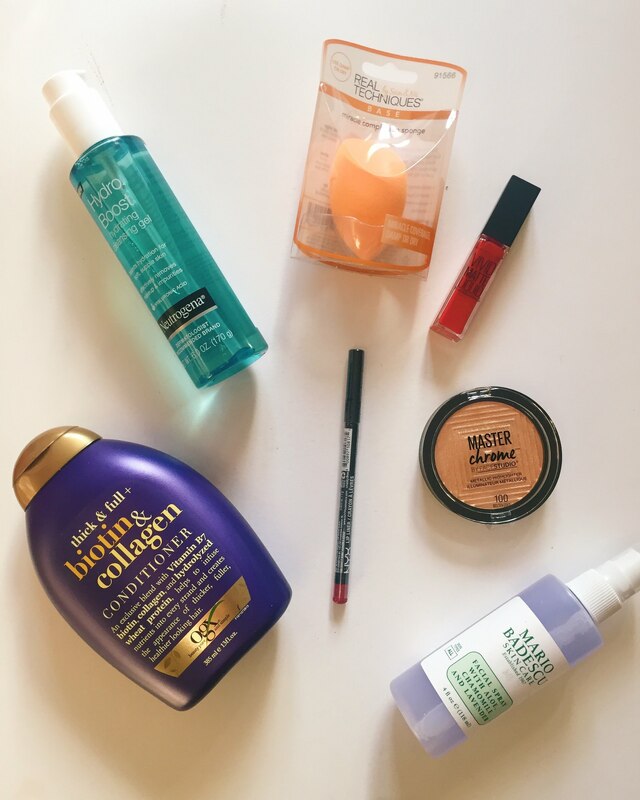 What I like about shopping at Ulta is that I can find great drugstore and high end products in one location. Saves extra time in the car driving around.